With One South already leasing, Centerra wrapping up, and Silvery Towers about to rise--the big question is which residential tower is going to go up next. Well, that question may be answered very soon. Simeon Residential Properties (one of the companies behind Centerra) purchased a half-acre site across from the Greyhound bus station. 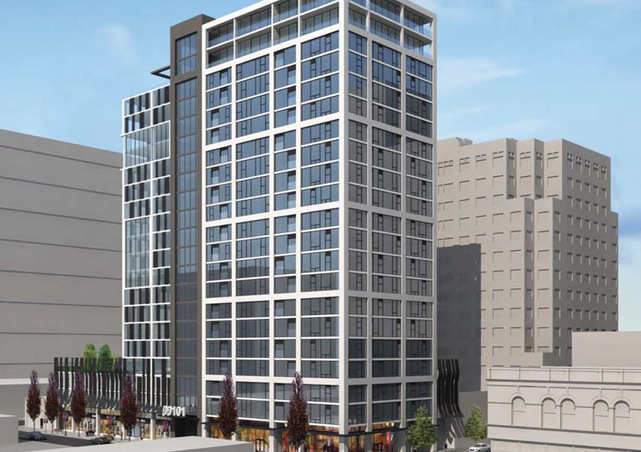 This is a turnkey development site that already has approval for a 21-story tower with 180 residential units and 7,000 SQFT of retail. Parking will be shared with a neighboring office building, a concept pretty new to San Jose. The good news is that Simeon seems really eager to get going on the tower. The plan is to get the construction drawings done ASAP and break ground in early 2016. You may remember a previous drawing for this site, which you can see below. Personally, I like the eclectic design that makes the tower look like 3 different buildings scrunched together. Hopefully they'll keep some of these elements after the revision. Two other projects could also break ground in 2016: a two-tower Barry Swenson project at St. James Park and a tower across the street from City Hall.